Many of us who want to find the " new to us hiking trails" very likely want it tucked away where the crowds do not go. 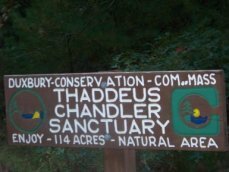 The Thaddeus Chandler Sanctuary is one of those such places. To reach this area one must travel down route 53. This route many times is used to drive through Duxbury, not necessarily to visit areas of interest. Most people, when they think of Duxbury and visiting, conjure up thoughts of the beach or the areas with quaint shops and eateries. 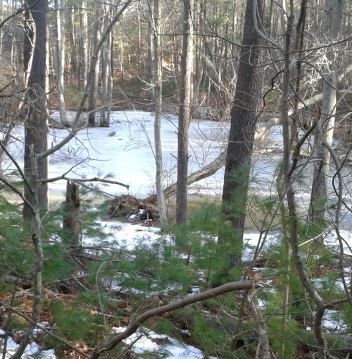 A large portion of Duxbury though, contains ponds surrounded by heavily wooded area. This is what you will find at the Thaddeus Chandler Sanctuary. 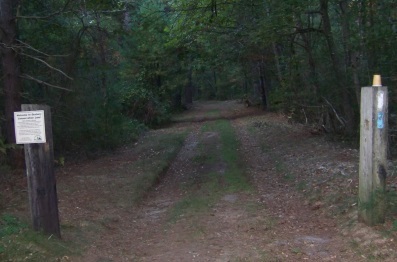 Duxbury, like many towns of the South Shore, contain older cart paths and roads that most likely existed down to colonial days and are still used for off road travel today. The Thaddeus Chandler Sanctuary borders and blends into several of these paths. My first visit on these hiking trails left me leaving the Sanctuary quite quickly and unknowingly. Though a recent visit I found signage that will keep this from happening to you! Where ever one of these signs are found, you will know you may have reached a border. Though these signs are liberally sprinkled throughout the sanctuary. Good info for finding your way back to your car! There are several features to the Thaddeus Chandler Sanctuary. At the parking area there is a small trail leading to the left. This brings you directly into the hiking trails of the sanctuary. There is a wide road like trail to the right. This is the way the Bay Circuit Trail enters the property. 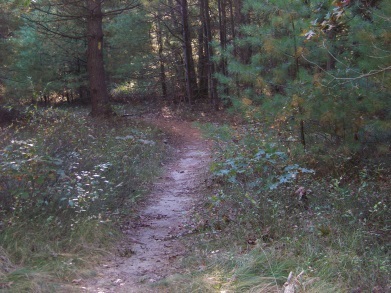 You will find the familiar white rectangle that marks this trail alongside the blue rectangle blaze that marks the longest trail in the sanctuary. This road will bring you to Chandler Pond in 1/4 miles. Along the way if you look carefully there are some hiking trails leading to the right along this road. These may not be official trails of the sanctuary as they are not marked, but they lead to the side of the pond or perhaps to well used fishing spots. Great to explore on any occasion! My first visit I went straight to the pond, noticed the large rocks at the furthest point after the pond. I then found a trail beyond these rocks, thinking this was the trails of Thaddeus Chandler, I followed these right off the property. There are three color blazes used to mark the trails here. Blue that follows the main road trail in. Yellow is the color of the trail that leads out of the parking lot to the left. There is a red trail that connects the two. The Bay Circuit Trail enters the sanctuary along with the blue blaze trail on the main road in. When the blue blaze trail goes left, either follow the main road straight, or an alternate way is to follow the left with the blue blaze, but as the blue blaze takes it's second left ,the BCT continues straight here and meets the original route at a point further on the trail. If following straight on the main road, there will be the start of a rock wall to the right, but it will abruptly stop. In the early spring or any time of high water, this route may be a bit of a challenge as there are times that large pond like puddles form. Along the way a faint hiking trail will run to the right leading uphill to the network of trails that lead alongside the pond as well as into that side of the forest. At some point on this side, you will be on a ridge that overlooks a view of the intersection of Valley and Franklin Sts. 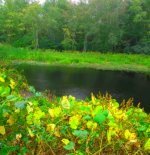 At just about 1/4 mile, just short of the area the pond opens up at, the hiking trail comes to an intersection. The BCT takes a left here. 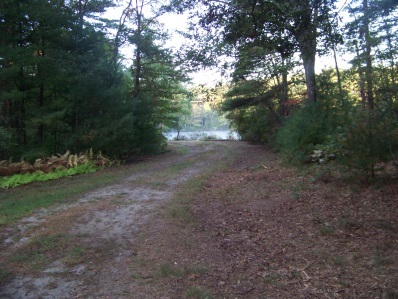 If looking to the right you will see a wider trail leading into the network of pond side trails. Taking the left, the trail becomes cart path sized and crosses a culvert. 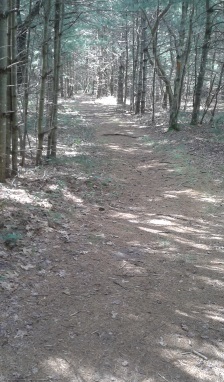 The alternate BCT trail leads in from the left here. 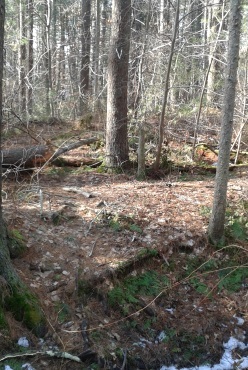 On the opposite side of the culvert, looking closely a narrow trail can be seen following into the forest. This narrow trail will eventually lead to a private residence on a fairly lengthy and interesting route. Of course, if this is your first visit to Thaddeus Chandler, do take the time to check out the pond. The BCT now follows the stream and at .32 the remains of what may have been a small bridge appear in the stream. On the opposite side of the stream, the narrow trail to private property can be seen running through the forest. The BCT will curve with the stream to the left. At .43 it crosses a culvert and the narrow trail across the stream will do the same as there will be another smaller stream intersecting the one alongside the BCT. There will be a short trail down to the water here, a good place to filter water. It also appears that in times of lower water flow that one could cross the stream to explore the other narrow trail here. At 1/2 mile the blue blaze trail intersects and joins the BCT. Soon both hiking trails cross another of the many culverts in the sanctuary. 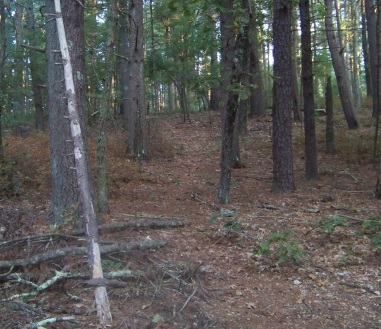 At .61 there is what appears to be a clearing and the red blaze trail intersect is found here. The BCT now turns right and runs wide clear and level. The forest on the left is noticeably open in the winter. It runs a bit downhill and then makes a couple of climbs. At .78 intersects a trail that cuts across it. Some cut up logs help to mark the intersection. Just after the BCT comes to a fork in the trail where it sweeps to the left. At .96 the yellow blaze trail will lead to the left and just after at 1.01 a closed trail will lead off to the left. The BCT will make a right here and if looking carefully a narrow trail will lead to the left as the BCT starts to make a climb. This is a good winter entrance to the property if trail parking is allowed. It runs uphill and out to a country store parking lot. After the BCT takes the right and runs uphill, partially up, another connecting trail will lead to the country store trail. The climb will level at 1.08 and a few steps later come to an intersection. Here the blue blaze continues straight, an unmarked alternate route of the blue blaze leads right, and if looking carefully you will find a white blaze partially covered by a downed tree on the left. The BCT takes this left on a barely defined trail. It will lead downhill and at 1.18 comes alongside a woodland pond (may be dry in the summer). It will climb, crest and run downhill again on a narrow track. It then crosses a marshy area that may be tough to cross in times of high water levels. It then climbs out of the marsh and levels a bit but runs through a rough patch through a glacial depression and up a fairly steep climb to route 53. 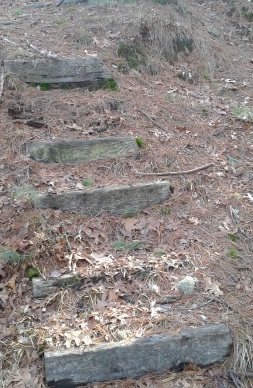 There are some older railroad tie stairs to help, but looks like most go to the side of these. Once up at route 53, the BCT takes a left and follows behind a guardrail. 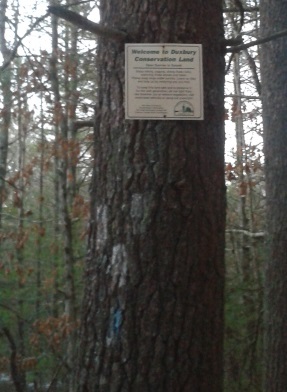 it crosses route 53 and continues on a hiking trail across the street marked by a Duxbury conservation sign in the Lansing Bennett Forest. A loop can be made by going left through the parking lot and accessing the trail on the other side of the parking lot. A steep climb up, the trail curves to the left and down to the intersection with the closed trail at 1.52 miles. Following the yellow blaze hiking trail from here back out to the entrance came to just short of 2 miles. The trail marked in blue rectangles is the longest trail in the sanctuary. Starting from the parking lot on Valley St, both the blue blaze and the Bay Circuit Trail follow the wide road into the property. Currently (Feb 2016) many of the blazes are faded. Shortly up the road the blue blaze trail leads to the left. Some of the faded blazes make it confusing here. It appears the Bay Circuit Trail goes left here, upon finding an early image of these blazes, it shows that the BCT goes in either direction. Going left here, the hiking trail narrows just a bit. This is actually another road like trail and leads along what appears to be a shallow stream, but the area looks to have formerly been a nursery with irrigation canals through out. The trail will pass over a small culvert with another of the conservation welcome signs. Much green ground cover (creeping myrtle) is along the trail here, a welcome sight in winter! At .18 the blue trail now takes another left. The hiking trail heading straight here will meet with the original route the BCT takes, but this does add a bit to the confusion in the area. There should be more BCT blazes. Heading left on the blue blaze trail, the way becomes cart path sized and pine needle carpeted. At .27 the trail passes over another culvert. 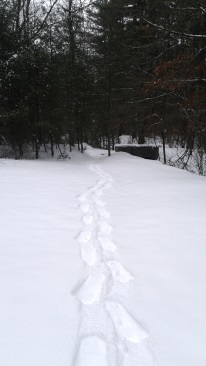 On a snowshoe hike this past winter, there were a variety of animal tracks at this point of the trail. After the culvert the trail becomes a mix of grass and gravel. Soon the trail comes to an intersection at .34 miles. This is where the BCT and the blue blaze trail meet again and run together through the sanctuary. Going left to continue, you will find both blazes together again and the hiking trail will once again pass over another of the many culverts on the property. The trail will become a bit sandy and what almost looks like a clearing will appear on the left. If you take the time to explore this clearing, you will find the remains of where a shack once stood. Shortly after at .46 the red blaze trail will continue straight. The way of the blue blaze and BCT will go to the right. Though you will not find any blue markings. The trail is back to pine needles and will run down hill slightly. A bit further down the trail it will start a gentle climb uphill. The hiking trail will continue up a 2nd climb and through a stand of baby pine trees. At .64 you will notice a pile of tree stumps from some trail maintenance. If looking carefully you will also notice a narrow trail crossing the main trail. To the left this portion of the trail will short cut the BCT. To the right, if followed, will run some distance and end at a cul de sac at the end of Cranberry Drive, off Birch St, a good winter snow entrance to the sanctuary. At .68 miles the hiking trail now forks. Here you will find the blue rectangles indicate to go to the right and the BCT follows to the left, yet there will be no markings to indicate this for the BCT. Yet if you go left you will still see blue rectangle markings anyway! This will be so as the blue blaze trail makes a large loop in this portion of the sanctuary. This continues to add confusion for the first time visitor. Going to the right at the fork, the trail narrows, leads downhill and then curves to the right. Shortly after there will be a fence with the conservation sign and a trail intersect. It appears that this portion is now on private property. The intersecting trail is cart path sized and what appears to be either a marsh or non functioning cranberry bog along the opposite side of this trail. The blue blaze trail goes left here, though there are no blazes or signs to guide you. Shortly down this cart path you will arrive at another fence with the Duxbury Conservation sign a fixed to it at .80 miles. Just into the trail another narrow trail leads left. This is an alternate route that will end up at another intersection with the blue blaze trail. The blue blaze trail continues straight here and the blue rectangles start to appear once again. 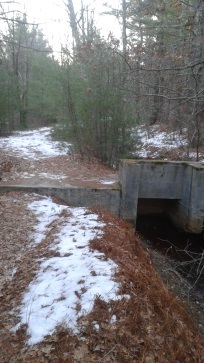 At .93 the trail crosses another culvert with a pine tree growing atop it. Just after, the marsh on the right ends and a faint trail leads to the right. The blue blaze trail curves to the left, becomes narrow and runs along a hill below some private residences. 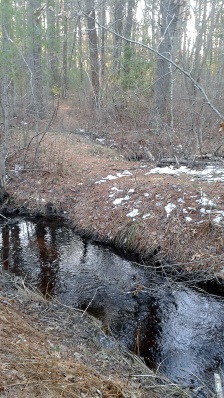 Along the left here the trail runs alongside a vernal pool. Trails leading uphill and to the right most likely lead to residences there. 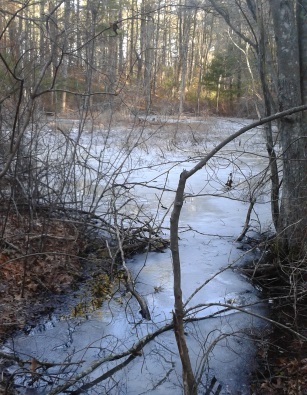 At 1.05 the trail reaches the end of the vernal pool and crosses a wet area. It then climbs moderately. An old log helps cross the wet area, but I was glad to have my waterproof boots on! At the top of the hill at 1.08 you will find the intersection with the alternate trail. Across from the alternate trail entrance is the almost unnoticeable right the BCT takes. 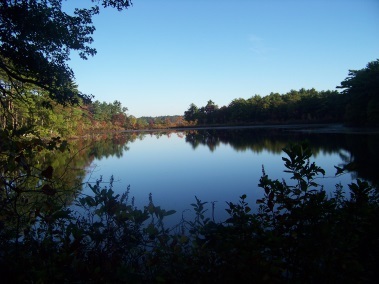 There will be another vernal pond on the right below the hiking trail. The trail will continue going uphill slightly once again. At 1.17 the trail now starts to descend. As you descend you will notice a trail closed sign. Along the way down, to the right the blue and white blazes faded appear together again and indicate a left turn. The blue and white rectangles are together once again and the trail turns to the left. 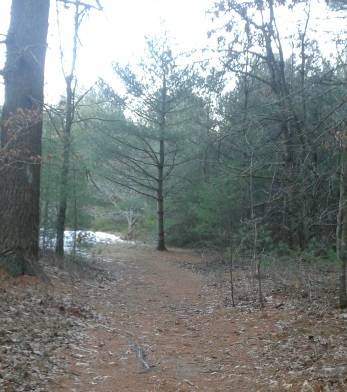 At 1.24 the trail intersects the other side of the closed trail portion. At a soft right will be a narrow trail, that if you look carefully you will notice the faded yellow rectangle. If you prefer a shortened journey, this can be taken as a direct route back to the parking area. At 1.35 it climbs slightly again with the short cut trail appearing to the right. Shortly after at 1.40 miles the trail comes back to the original intersection where the blue and white rectangles separated. If following back exactly as you came in the mileage will end at 2.08. The Yellow Rectangle hiking trail starts from the main entrance and is located to the left of the main road in. Enter through the gate and go left, as the trail enters the forest it leads down a short steep pitch into a thick vegetated area. This part of the sanctuary appears to have been a nursery of some sort. There are a network of irrigation canals that crisscross the area. A series of small bridges brings you over these canals. Well shaded and lush in the summer, interesting any time of the year. At .21 it leaves the nursery portion and enters the more forested part of the sanctuary and intersects with the Red Blazed Trail. Continuing straight softly winding through the wooded forest, a closed trail appears on the left at .29. There will be a slight descent after this and just after 1/3 mile an older granite engineering stamp will be found on the trail. Shortly after this the yellow blaze hiking trail will let out on the Blue blaze trail along with the Bay Circuit trail. The red Blaze trail is found on the blue blaze trail not long after it joins the Bay Circuit trail at an area that appears to be a clearing. It runs just short of .10 miles. It travels along an edge of the nursery area of the sanctuary and joins the yellow blaze trail as it leaves the inner nursery area. 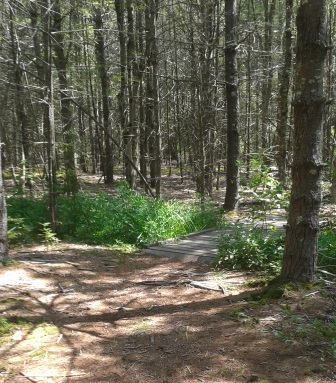 Both these trails are important as connector trails to make hiking trail loops of varying lengths. Both hiking trails make it possible to shorten the distance to a vehicle parked at the entrance. 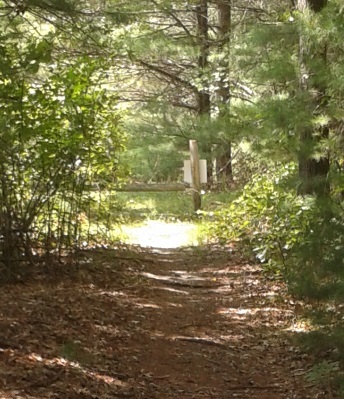 The trail out to Cranberry Dr. from inside the sanctuary is marked with white V's. 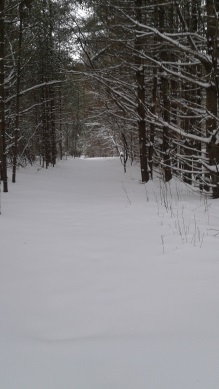 Winter can make it difficult to hike many of the trails on the south shore. There are two suggested alternate winter entrances to the trails here. Cranberry Dr. off Birch St in Pembroke has an unmarked hiking trail at it's cul de sac end. There is a basket ball hoop located here and to it's right is the trail. It is a bit less maintained than the rest of the forest but still easy to navigate. This trail splits at about halfway in it's length. If following straight at this split, it will take you to the area where a pile of wood sits along side the trail where the blue blaze and bay circuit run together just before the two split. If following to the right at this halfway point trail split, it will take you to a cart path that is just off the sanctuary property but seems to be used as the route of the blue blaze trail. Once to the cart path take a left. Follow along the trail along the marsh and you will soon find the fence with the conservation logo fixed to it. The other possible winter entrance, though permission may need to be obtained to use this, is at the country store on route 53 at the corner of Valley St.
At the far end of the store parking lot an obvious trail runs fairly steeply uphill and many neighborhood children use this as a cut through using the sanctuary. Both of these areas has evidence of being plowed out in winter months. peaceful hiking trails here in the winter! but strenuous if you are the first one in! From exit 10 on route 3, follow route 3A just into Kingston with it's intersection with route 53. Take a right on route 53. Continue following rt. 53 after it's left turn onto Summer St. Approx. 1/2 mile take the left onto Valley St. Parking is shortly down the street on the left. In the Winter: Follow the same directions, but before Valley take the left on Birch St. The first right will be Cranberry Dr. Follow to the end and park in the cul de sac. Narrow trail leads to right of basketball hoop. Approx. 3 vehicles on Valley St. Same allowance on Cranberry Dr.